Get a jump on school success for next year. School is out (or almost out), summer is here and it’s time to take a deep breath, survey the damage, and assess what worked and what didn’t this past school year. To help you get a jump-start for September, I’ve gathered a few of my and my students’ favorite organizing and time management products! Reinforced Paper. How can something so simple be so life changing? Yes, it costs a little more than the regular kind, but it will not disappoint! It is virtually indestructible. And remember if the paper stays in the binder, your student is organized without even trying. Pure genius. Extra tip! Buy in bulk. Buy it here. Delta Planner vinyl student sleeves. What? Yes, I hear you but trust me on this one. I am taking up a petition to get this product into stores. 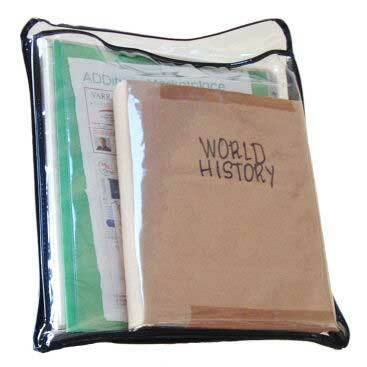 They are large, CLEAR, vinyl sleeves that can hold whatever your student needs for each subject. They fit in a locker, a knapsack, and most importantly, give that homeless piece of paper a “home” until your student has a moment to put it in its place. What could be better than that? Extra tip! Put a big label (or color code) on the top of each one so your student can identify each subject quickly. Buy it here. Post-It Notes. I know, but sometimes the best solutions are right under our noses. Think about it! What better way to organize your child’s room than with Post-Its? Stick them on dresser drawers so the kids know what’s inside. Also take the initiative and label hand-held electronic equipment, cords, closet shelves and even the laundry basket! Extra tip! The large pads make the perfect chore or responsibility chart. The neon colors make those lists hard-to-miss. Buy them here. Time Timer. Come to Mama! Seriously, I have yet to meet anyone who doesn’t love love love this timer. It is a MUST in my work, for my family and my students and it needs to be for you too! It is a visual timer that allows you to see the movement of time. As time ticks down, the red disc starts to vanish and when it is gone, your time is up. Great tool for those who need visual aids for timed tasks. Extra tip! Download the software to your computer or load the app to your phone so you are never without. Get more information here. Noisli. Many of my students need “noise” to help them focus. Some listen to music, while others just like “white noise.” Check out Noisli where you can pick the sound you would like to listen with just one click. So for example, while I was writing this article the wind was blowing softly and the birds were chirping. Very relaxing! Extra tip! If you find the screen distracting while working or doing homework, just minimize it and you will still get the soothing sounds! Check it out here. Quizlet. Ok. So here’s my confession. I am deathly afraid of technology. I am a paper and pen girl. For me when I write it, I commit to it. BUT, not everyone is like me and over the years I have had to adapt and learn FROM my students. And ALL of them, seriously, all of them, LOVE Quizlet. Like mad love. So I am not even going to explain the benefits. Just go to their site and if your student hasn’t already fallen in love, watch them do so! What are your favorites? Reach out to me at Leslie@orderoochaos.com and let me know you favorites, too! Feel free to share!